There can only be one winner... right? This article was provided by Maximum PC magazine for TechRadar PC Gaming Week. Click here to subscribe. Both are head-mounted displays, but is that where the similarity ends? A virtual-reality headset aims to pull you into a fully realized world, but Microsoft says its augmented reality headset is content with keeping you in the real world, just with added holographic goodness. We've had the rare chance of trying out both the HoloLens development kit and Oculus VR's newest Crescent Bay headset. These aren't the final retail versions, but here's how they compare currently. Both products are at least several months from release. Rumor is that Crescent Bay Rift, which Oculus says is a prototype of what its first consumer version might look like, is using a 2560x1440-resolution panel at 90Hz and with a 100-degree field of view. There's also 3D positional audio that will tie in well to the Rift's excellent stereoscopic 3D visuals. Rift will rely on an external camera for positional head tracking, which Microsoft's HoloLens will not use. And because the Oculus Rift obstructs your view of the "outside world," Oculus maintains that the Rift is intended for seated experiences at the moment. This isn't the case with HoloLens, however. Because you can see the virtual along with the real, Microsoft is fine with you walking around with the headset on. Microsoft says that the final version will be wireless. Unlike the Oculus Rift, which needs to be plugged into a PC, the HoloLens will be a self- contained computer running Windows 10 with its own CPU, GPU, and a new holographic processing unit (HPU) to tie everything together. HoloLens does have some similarities to the Oculus Rift, however—it will support stereoscopic 3D and have speakers that provide positional audio. Other HoloLens features include an integrated depth sensor, finger-swiping gesture support, and a built-in mic. Some of that could be coming to the Rift as well, with Oculus recently acquiring camera/ hand tracking firm Nimble VR. 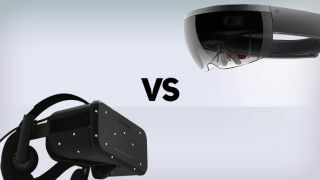 A big difference between the two headsets in their current states is that the virtual field of view is smaller on Microsoft's headset. There's also no definitive word on how sharp the final HoloLens will be. Microsoft told us "HD," which indicates at least a 720p display. If what we saw is any indication, we'd say it's in good shape. We thought it looked pretty sharp. Both headsets are trying to sell you on immersion, but which one really nails it? They offer two very different experiences. With the HoloLens, Microsoft isn't trying to shield you from understanding where you are, but it does an excellent job of representing virtual things in your room that aren't really there. Still, we'd have to give this nod to the Rift, because if it's pulled off correctly, it really convinces you that you're in a different universe altogether. We're confident virtual tourism will work better with the Rift, and that games will also be more intense and scarier with Oculus's offering. When we tried on the Crescent Bay demo at GDC 2014, there was a demo where we saw a giant T-Rex approach us and it felt like it could really bite our heads off (à la Jurassic Park lawyer scene) if he really wanted to. It was kind of unsettling. Plus, the Rift currently offers a more encompassing field of view. With Facebook buying Oculus for two billion dollars, we're sure social media, video chat, and such will be big components for the Rift. But you can see the virtual with the real with Microsoft's solution, so we're picking HoloLens for productivity potential. At January's press event, we were asked to put on HoloLens and fix an electrical socket with real tools. Using Skype, the person on the other end could see what we we were seeing and draw on their touchscreen to offer advice. We can see this being used to fix cars and can easily imagine HoloLens being used in the ER. We also know HoloLens will support finger gestures. This will allow you to use MS's HoloStudio to make 3D objects, and send them to a 3D printer. Microsoft says it's the best print preview for 3D printing out there. With HoloLens, the lines between the real and digital will become blurrier.